Before doing any levelling, you need to be sure that you are working with a straight neck. I’m using a Stewart MacDonald notched straightedge which allows me to read the fretboard. I adjusted the trussrod until the fretboard was flat. 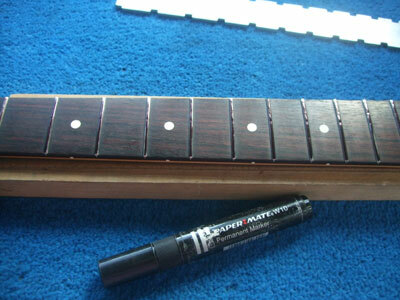 I have marked the top of each fret with a marker pen. This is so that I know when all low spots have been removed. 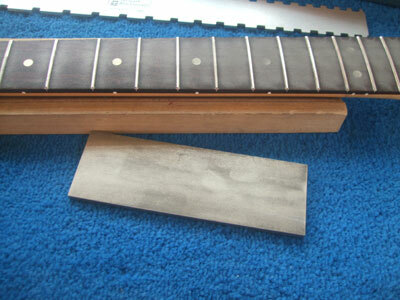 To do most of the work I used a Stewart MacDonald fret leveler with 180 grit carborundum attached with double-sided tape. 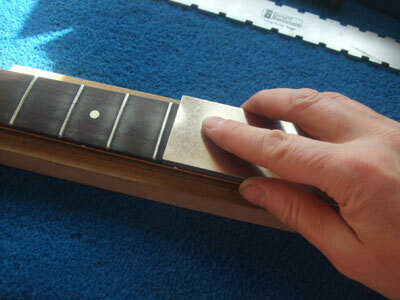 It quickly cuts through the frets to give an extremely flat surface. You need to ensure that you closely follow the radius of the fretboard. You can see here how the marker pen shows up any low spots that remain to be dressed out. Nearly there now, time to switch to a finer abrasive. 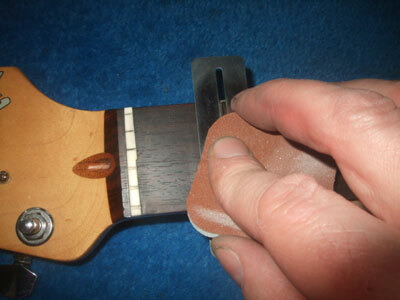 To smooth the fret tops I use a Stewart MacDonald diamond fret levelers in progressively finer grades. 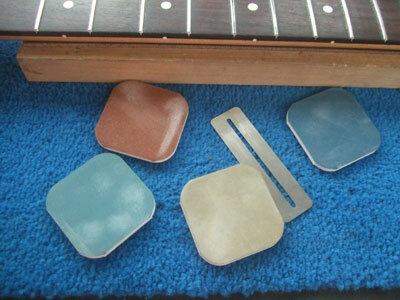 These are industrial diamond-coated steel blocks which are great for leveling frets. Again, you need to ensure that you closely follow the radius of the fretboard. For a super-low action it’s a good idea to file a slight fall-away on the tongue of the neck. 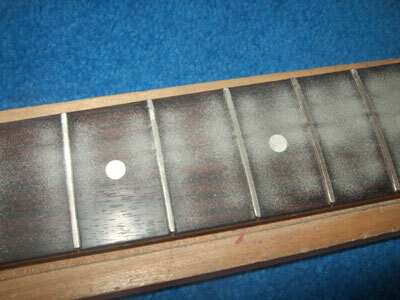 The next step is to restore the rounded crown to the top of each fret. This is done useing fret crowning files. I have a selection that I choose from depending on the size of the fret and how much metal need to be removed. 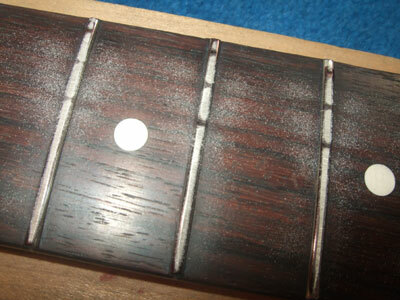 The idea is to end up with a “landing strip” about a millimetre wide on the top of each fret. I’ve highlighted it here with more marker pen. 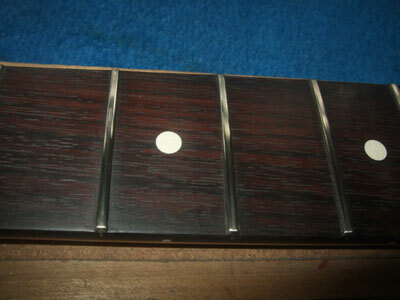 Now that the frets are level and crowned it’s just left to polish them. I used Stewart MacDonald Micro-mesh soft touch finishing pads to remove any sanding marks remaining on the frets and to buff to a high polish. 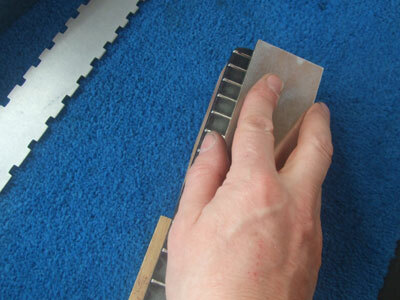 This process also ensures that the fret ends are gently rounded and comfortable for the player. 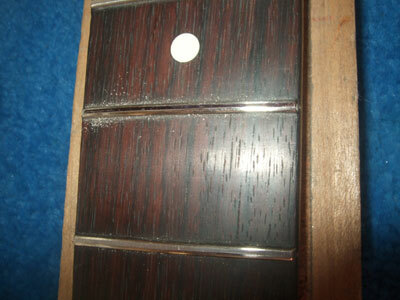 Here are the frets after being polished with Micro-mesh. All that’s left to do now is to clean the neck of any metal particles. 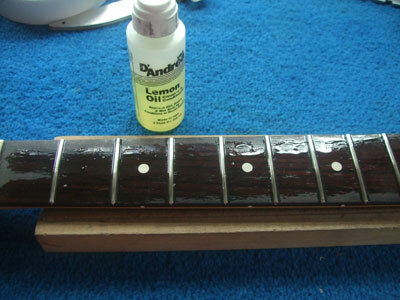 I use lemon oil to do this which ensures that the fretboard is clean, smooth and a joy to play. I have an American Strat that I bought last year. It’s frets appear dented already. Is this correct or do I need it repaired so soon? Hi Adrian, Fret wear depends on a number of factors, e.g. 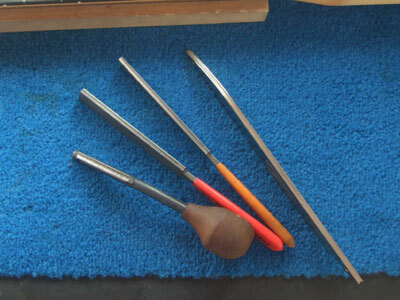 how much you play the guitar, your playing style, type/material of strings etc.. All frets wear eventually and need maintenance once the wear starts to cause buzzing, choking or dead notes. 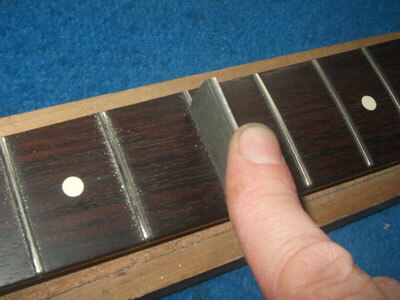 The frets can be dressed a few times before needing to be replaced, and if yours are giving problems, maybe it’s time for a fret dress? 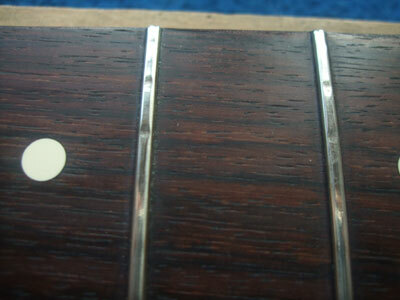 Hi, I’m trying to contact you for you to have a look at my guitar that needs a fret dressing but when I go to the contact page I get to Google map. Can I please have a number I can call to make an appointment? Do you use the StewMac Neck jig at all? I wonder if there is any advantage to dressing or refretting with the neck under duplicated string tension, which the jig allows. Or, is it enough (and much less expensive) to adjust the neck flat as possible with the truss adjustment? I don’t use the Stewmac jig and have never found it to be necessary.